The weather was absolutely perfect in California while we were there--if anything, a bit too hot! Anaheim had highs in the low 80's and lows in the mid 50's, and I checked the weather for Orlando and it was cold and/or rainy every day while we were there so we definitely felt like we picked the right parks to visit that week! Disneyland has Sleeping Beauty's castle, while Disney World has Cinderella's. Aurora's castle is much smaller, but it does have a really cute walk through that tells wanders up and down narrow staircases inside it and tells the story of Sleeping Beauty. It's really simple but has cool visuals, and my kids loved it! I didn't get any photos because it's pretty dark and narrow, but you can see it here. Last time we went to Disneyland, we rented a City Mini GT Double stroller through City Strollers and fell in love with it. We actually loved it so much that we came back and sold our other double strollers and bought our own. We bought the travel bag for it earlier this year, and even though it's absolutely massive, it's completely protected it in both gate checking it and checking it with our luggage. We went with this stroller because it has a higher height in the seats than a lot of double strollers, so it still fits Miles really well at 5, and hopefully will continue to fit for a few more years. It also reclines to almost flat and has separate sun shades that come down super low, so it's wonderful for the kids to take naps in. While the kids napped, Brad and I would take turns riding rides the kids are too little for, like the Indiana Jones ride (amazing ride not found at Disney World, but very similar to the Dinosaur ride at Animal Kingdom) and the Radiator Springs Racers in Cars Land. I think that may be my new favorite ride, ever. It's so fun and everything around it is just incredible looking. While none of us are really fans of the Cars movies, the land is absolutely beautiful! It looks just like the world created in the film and it's really hard to capture it in photos, but it feels so immersive in person. We LOVED this spot while the kids napped. It was absolutely breathtaking and feels so real, even though it's completely fake, haha! It was also shady and there was a nice cool breeze coming through. We really love that Disneyland still has so many of the original rides from when they opened in 1955. 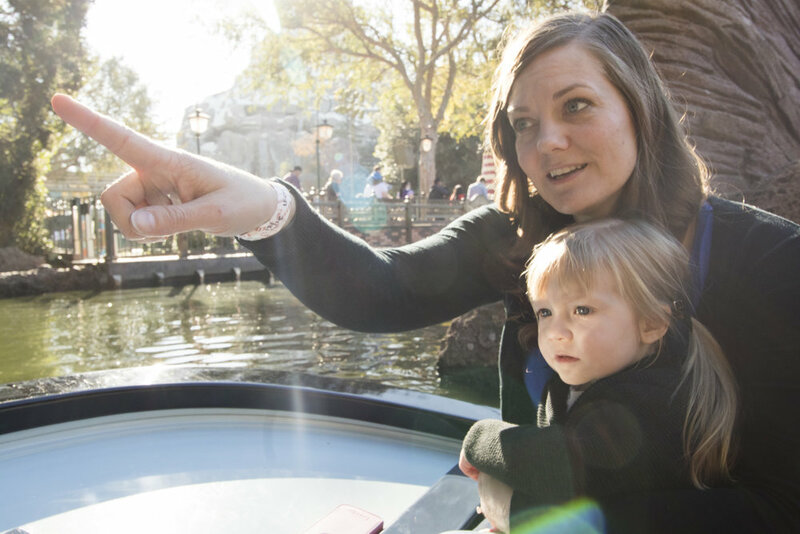 There's so many that are just adorable, especially the Storybook Land Canal Boats. It's a really cute ride in a gondola that winds around miniature houses and places found in Disney movies. Casey, Jr., the train from Dumbo is a separate ride that also goes around Storybook Land, offering a view from above. One of the most magical moments by far was going to ToonTown when it opened. ToonTown is a land in the park and it opens later and closes earlier than the rest of the lands. When they open the gates, some of the characters come out to greet everyone that is coming in. Goofy came out and Matilda ran up to him. He immediately took Matilda's hand, and walked her through the gates! 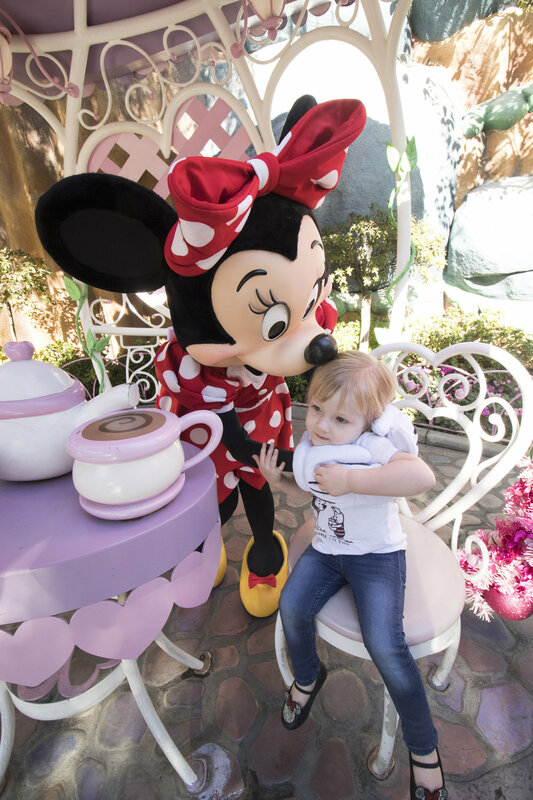 A few minutes in, though, she saw Minnie and said "I want to hold Minnie's hand!" so she ran over to Minnie and grabbed it! 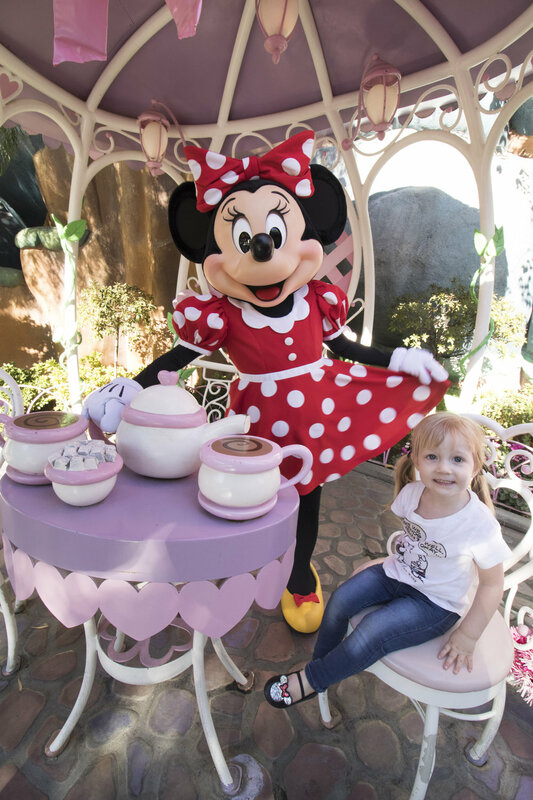 Complete change from the 14 month old that cried when characters talked to her the last time we were at Disneyland! ToonTown has lots of areas for kids to explore and all of the classic characters' houses. There's also a Roger Rabbit ride and a small roller coaster. We tried it out and thankfully it was very short, because neither of the kids really enjoyed it, haha! 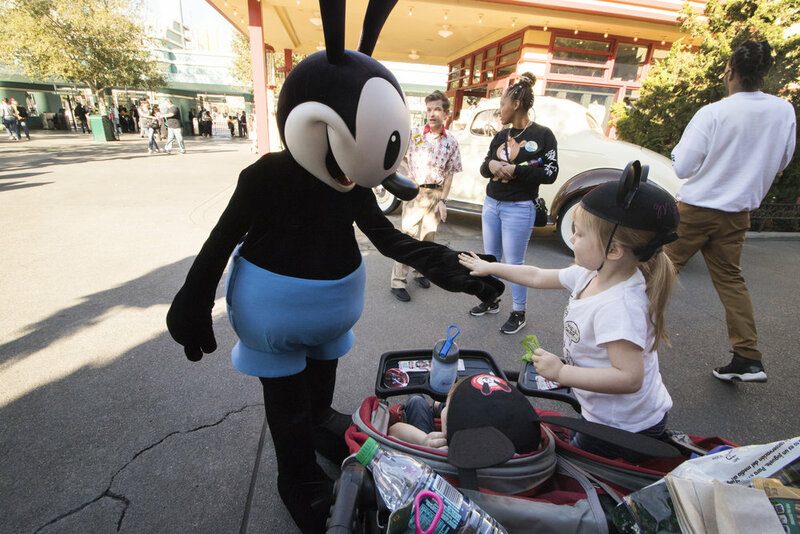 Over the past couple of years, Miles has loved learning about Disney history, so he was really excited to meet Oswald, the Lucky Rabbit. Before we even came to the parks, he had a mission of getting his own pair of Oswald ears. 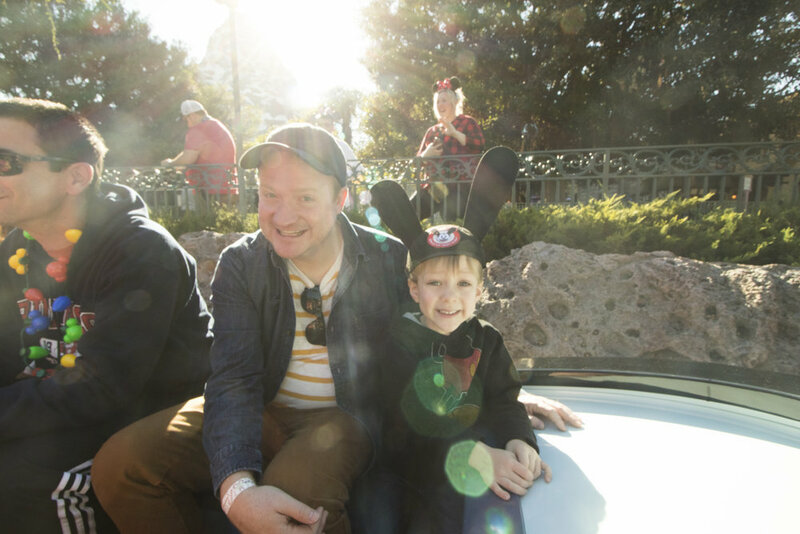 We all enjoyed imagining a bizarro-version of Disneyland, if Disney had been able to keep Oswald, everyone might wandering the parks in Oswald ears instead of Mickey ears! 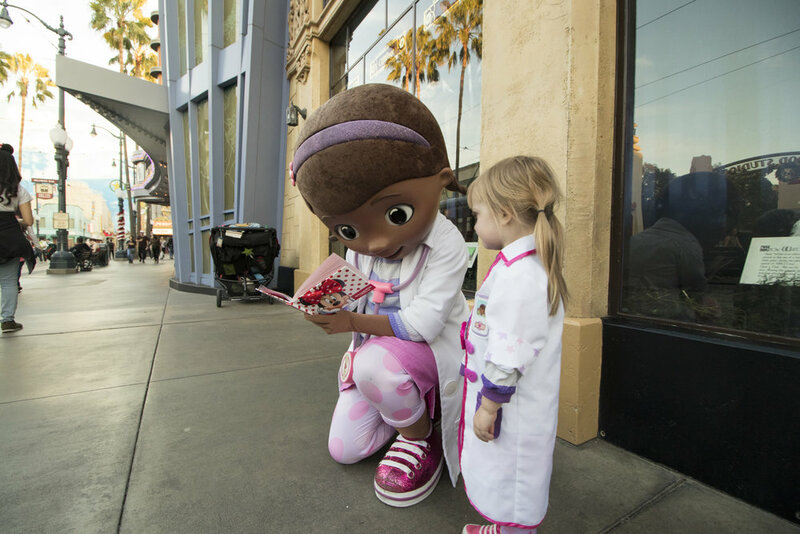 Matilda went as Doc McStuffins for Halloween this year and was so excited to meet Doc dressed as her! She was also so excited to meet Elsa and Anna from Frozen, and they were so kind, and took so much time talking to her! I feel like the characters that aren't hidden within a large mask really all seem to do that at Disney, which just makes it extra magical! After we got back, Brad took all of our videos from the trip and edited them together for the kids, and shared it with them on Christmas eve. They loved it and have watched it almost daily since then. An amazing diorama map of Disneyland the day it opened in 1955. For his fifth birthday, Miles asked for a Disneyland-themed party, and I've been kicking ideas around in my head all year for it. As we got closer and closer to December, though, I just started to feel overwhelmed–Brad's travel has been crazy this year and by November we were all just pretty exhausted and in need of just some time off and time together with our family. We started considering the idea of just taking a trip and going for a few days instead of throwing a party. We decided to give Miles the option, and let him decide (we didn't want to take away his party if he'd really rather do that), and after thinking it over for a couple days (seriously), he picked trip. And a Disneyland party for next year. Haha. We planned very last minute--only about a month before going, but that's one of the things we LOVE about Disneyland compared to Disney World--you can totally do that and you're not really at a disadvantage. 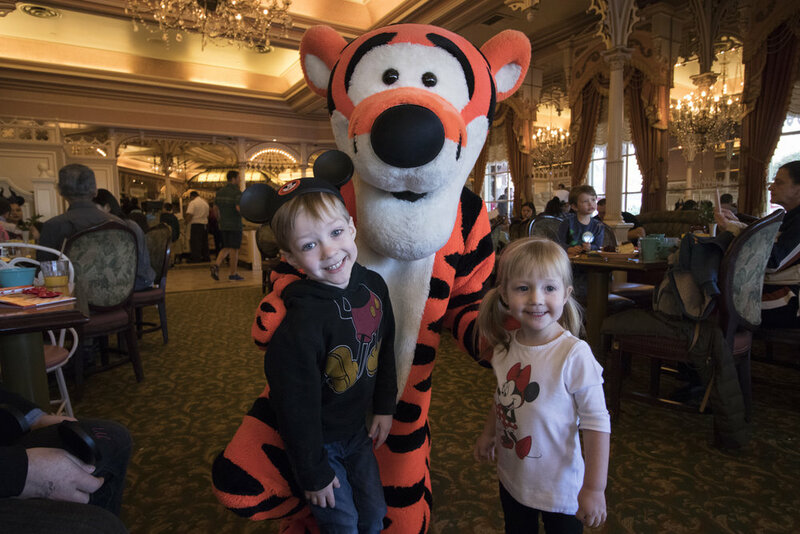 In the past few years, Disney World has completely changed to be geared towards vacation packages, which can be amazing, but also a bit overwhelming. If you don't book dining and fast passes and everything in advance, it's a lot more difficult to just show up and have as good of an experience as someone who booked a year in advance. Disneyland isn't that way. You can't even book fast passes in advance–you can only get them once you're inside the park. There's also only two parks versus the many that now exist as part of Disney World, so you can plan a short vacation of 2-3 days and actually still see everything. The parks are also right in the middle of Anaheim, so there are hotels within walking distance everywhere! There's three Disney properties, but since we knew we'd only really be in our room to sleep at night, we decided to book a Disney Good Neighbor hotel across the street from the entrance. We stayed at the Fairfield Inn Anaheim Resort, and we only had an 8 minute walk to the front entrance of the parks each morning! While not exactly a fancy hotel, it was clean, the beds were super comfortable after long days of walking, and everyone that worked there was so nice! I mentioned we were visiting for Miles' birthday at the front desk, and they even surprised him with gummy bears and balloons in our room, with a card that said they were from Mater and Lightning McQueen. Miles was so amazed and wondered how the cars were able to get in our room, since it was on the second floor! Haha! We went the second week of December and the crowds really weren't bad at all. Moving from Central time zone to Pacific time really helps, too––we're all up super early so we can easily arrive at the gates right when they open, and experience way less crowds than later in the day. There aren't a ton of options for character meals, but we booked a breakfast with Minnie and Friends at the Plaza Inn, and a dinner at Blue Bayou--not a character meal, but the ride actually overlooks the beginning of the Pirates of the Caribbean ride, which the kids loved! We actually went to Disneyland for a few days in May 2016 when Brad was speaking at Living Room. I only brought a smaller camera then, but I also found it harder to take pictures because Matilda was only 14 months and basically in my arms or lap the entire time. Now that the kids are 5 and 2.5 years old, it's becoming much easier to actually get photos and document our trips better. I brought a DSLR for the first time in forever, and brought multiple lenses. I started off with a 24mm lens, but then ended up switching to a 10-18mm lens that I basically kept on my camera the entire time. I LOVED the wide angle and how we were able to capture so much more. Miles and Matilda love wearing costumes, so I let them pick out which ones to pack. 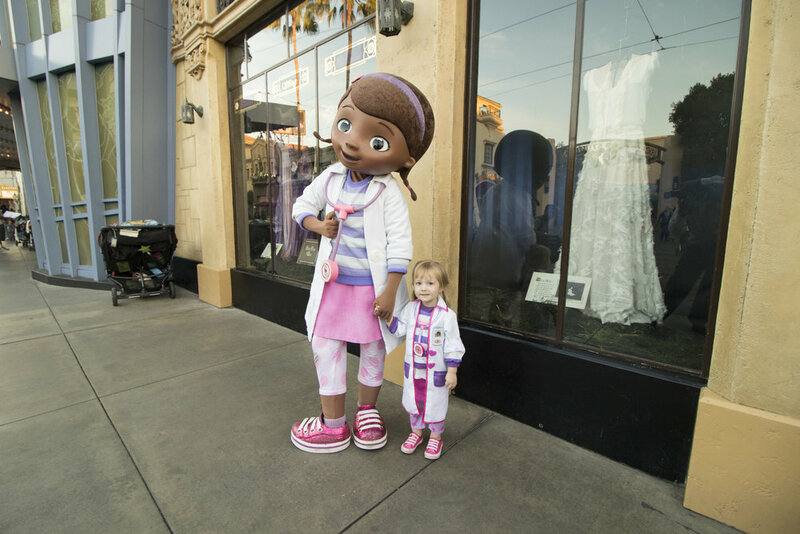 Each day, we brought in at least 4 different costumes per child so that they could wear whatever they wanted to in the park that day. We just kept the extra costumes in a packing cube in the basket underneath our stroller. Our kids love the Winnie the Pooh ride and The Little Mermaid ride, and while the line queues and lead up to the ride look completely different than the Disney World versions, the rides are actually identical. For some reason at Disneyland, though, there's hardly ever a line for either ride. Usually only about 5-10 minutes when we've been there, so we usually ride them multiple times throughout our trip! One of the biggest highlights of our trip was having our friend Correy join us with her adorable son, Hazel! Correy used to work for SoulPancake, and has been a huge part of our lives for the past 5 years, but it'd been over a year and a half since we'd seen her and it was our first time to meet Hazel! One of our favorite rides at both Disneyland and Disney World is Small World. It's just so adorable, and at Disneyland, it's extra awesome. They added characters from Disney movies all throughout the ride, like Pinnochio, Aladdin, Peter Pan and Tinkerbell and even Woody from Toy Story! It makes for a fun scavenger hunt, and they're created in a style that blends in well with Mary Blair's original designs. The queue for the ride is outside, and really beautiful as well--the exterior of the ride is huge and they decorate it with lights for Christmas and it's gorgeous. We also had the extra treat of visiting it at Christmas--the entire ride inside gets a Christmas makeover as well, including Christmas songs in other languages throughout the ride, and seeing Christmas traditions all over the world. The kids responded to characters SO differently than last time! Last time they were terrified and wanted nothing to do with them, but they absolutely loved them this time, and it was adorable to watch. 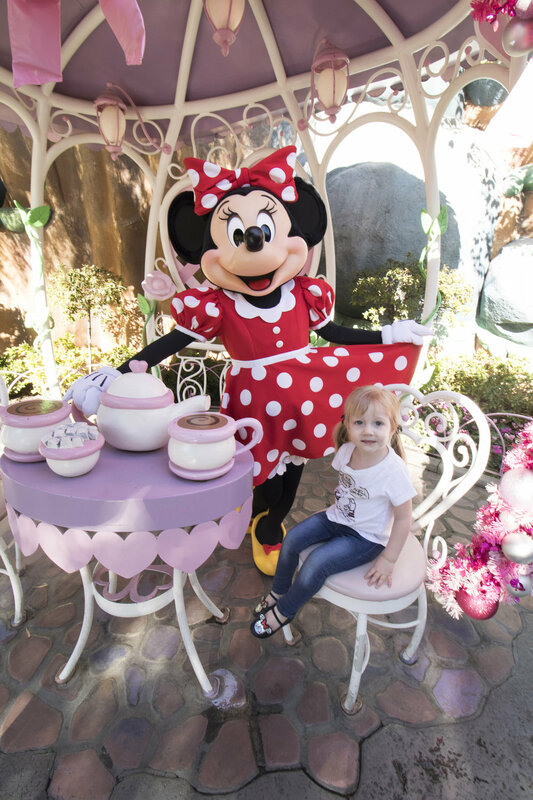 It made the breakfast with Minnie and all of the characters so much more fun! Miles was so excited that he was finally tall enough to ride almost all of the rides at both parks, and he after watching lots of YouTube videos of rides, he decided he wanted to ride lots of the scarier rides and was most excited to ride the Guardians of the Galaxy ride. It's a newer ride that used to be the Tower of Terror, so there's quite a few drops (actually, that's pretty much the point of the ride.) I tried to prepare him for it, but he said he really wanted to do it, so he put on his Rocket costume and he and I rode it. As soon as it shot up the first time, I knew he was not going to enjoy it. He grabbed my arm and said "I don't like this," but was brave through the ride and at the end concluded "It was a really great ride, but I do not want to ride it again." He loved Star Tours and rode it with both Brad and me individually (Matilda isn't tall enough yet), but also freaked out as soon as the Matterhorn took off, even though he was also excited to ride that. He decided to forgo any other fast rollercoasters that included drops after that. If you've met Miles and he's talked to you at all, you probably already know what kind of party he had this year. He's been talking about his SpacePartyForMyFourthBirthday since the day after his 3rd birthday last year. He's also been planning future party themes all year, assigning them to different ages, and letting us know what he's planning until he is 12 years old. (I'm completely serious.) Miles loves dreaming up parties as much as I do, so it was fun and extra special to really collaborate on his party together! I use WHCC for a lot of my printing and I've been wanting to try out their foil-stamped designs for awhile. They have different templates that are blank except for the foil-stamped part, so I chose this geometric design in silver and designed this using a photo from the Project Apollo Archives (which I'm completely fascinated with.) I was really happy with how they turned out and we used the Views of our Planets stamps from USPS to mail them. Miles has loved outer space, astronauts, rockets and the like since before he could talk. Brad and I are equally enchanted by space travel, so we knew eventually we wanted to do something space-themed be it a video, photoshoot, or -perhaps - a party. This past February, we happened across a Makedo cardboard space pod for 70% off at Target (we only paid about $24 total!) We knew it'd be perfect for a future party, so we bought it, put it in the storage room in our workshop and planned on saving it for whenever that would be. Miles saw it and was totally fine with waiting to open it up for his party, but he immediately decided the party had to be this year. We had thrown Matilda's 1st birthday party in the studio, and loved how much easier it was to not have it at our house. More space for kids to run around, we could setup and decorate ahead of time, no cleaning our house--the benefits seemed endless. And with a space theme in particular, we could get really creative by turning the infinity wall and surrounding studio space into outer space! We put the space pod together the week of Thanksgiving and were all SO excited putting it together. The words "this is so cool!" were said over and over as it came together. It came in a deceptively small box, because this thing is HUGE. I'm not quite sure how it would really fit in a normal-sized house, and we are planning to bring it home, but it's so large, it will probably take up most of the space on the floor of the playroom. One major benefit: it's big enough for grownups to play in, too! We found a star projector on Amazon that added a ton of magic! It was more expensive than we would have liked, but we decided to let the projector be his birthday gift so he could use it as a nightlight after the party. Lately Miles has wanted to sleep with tons of lights on in his room, and it's been a struggle to convince him to turn off his lamp and sleep with just a nightlight, so we thought this might help. It totally worked and now he loves falling asleep under the stars each night. It actually has two separate lighting elements you can choose between or combine. There is a green laser that creates "stars" which slowly move around, and there's also a cloud option where you can project animated blue clouds. The clouds are on a dimmer so you can adjust the brightness. Underneath the base of the projector, there are screw holes so you can mount it on a wall to hang and project, so that worked great for using it at the party. We have a double-sided theater flat with the Kid President cardboard backdrop on one side, so we pushed it to the corner of the curtains that surround the studio area and hung the projector on the backside of it. This allowed the projector to shine straight down onto the infinity wall (and kept it safe from kids running around) and the effect was pretty amazing. We have thick black theater curtains on a track around the infinity wall, and we took out all of the lightbulbs in the track lighting over the studio area so that it'd be completely dark except for the stars. For favors, I really wanted to make the DIY recycled jetpacks that kept popping up when I searched "space party" on Pinterest. (You can see all of the things I pinned in prep for his party here on Pinterest.) I used empty two-liter soda bottles (huge thank you to everyone that saved some for us and even dropped them by our house! ), metallic silver duct tape, colored duct tape, and scrap cardboard to form the main part of the jetpack. I basically followed most of this tutorial but I loved the "smoke" idea from this post, so I used polyester batting inside the bottles. I ordered 1 inch polypropylene webbing, slider buckles, and these buckles to create straps and a chest harness so they wouldn't fall off the kids as they were playing. I sewed the buckles to the straps so they'd be more durable, and everything held up really well, even through the kids playing rough! The flames were created out of yellow, orange and red felt and hot glued to the bottle's mouth. I created silver cones around the flames out of two pieces of metallic duct tape (sticky sides together) and taped it around the bottle opening with more duct tape. I made a few tiny ones for the smallest kids at the party with 20 ounce soda bottles and they were adorable! A few years ago, we found a Meri Meri Space Cadet centerpiece at TJ Maxx on clearance (I think for $7) and we bought it, but never got around to actually using it for anything. Then, a few months ago, we found a second brand-new one at a consignment sale for $3! We set up three tables, and since I only had two of the rocket centerpieces, for the third table I made a quick sculpture inspired by the design on his invitations out of string and silver drinking straws cut in half. I also cut out lots of silver cardstock stars with my Cricut Explore and sewed them together on my sewing machine to make garlands. I hung a huge piece of black backdrop paper on our wood wall, added letters cut out of silver paper and drew random stars and dots on it with a silver sharpie to create a photo backdrop. The moon on the wall is a Moon in My Room that I found for $5 at the same consignment sale as the rocket ship centerpiece! My mom found the Space Camp flight suit I'm wearing at a local thrift store for only fifty cents! It was in great condition and perfectly my size. When I found out they were $90 new, we decided to see if anybody might have one to fit Brad. I posted an ISO on Facebook and our friend David let us borrow this one for Brad. Miles' spacesuit was ordered from H&M in an after-Halloween sale, and due to a shipping mishap, we ended up getting an extra 25% off the clearance price! Matilda's planets shirt is from Zara. We also gathered up all of the different space toys and costumes we had at home--a few years ago I found two pairs of space boots, two helmets and two jetpacks made by Cranium at a rummage sale for maybe $5 total. We also have a rocketship costume that was originally sold at Target, but we got it a few years ago for $1 at Dirt Cheap. My parents have two Radio Flyer Spin 'N Saucers that they found years ago at Goodwill for only a few dollars each, and they brought those for the kids to play with. They LOVED scooting all over the workshop, but also used them as seats in the spaceship, and they worked perfectly with it. We also had Miles' Joybay Swing car there for kids to play with, and all of those worked great on the smooth concrete floors of the studio! A package of water beads, soaked in water overnight and put out in a plastic bin for kids to play in turned out to be a major hit with the little ones. They were a bit messy (but not a huge hassle to clean up). Worth it for the smiles. I decided to just go easy and simple with food and include kid-friendly stuff that wasn't all sugary and included lots of Miles' favorites. Grapes, Cuties mandarin oranges, cheese cubes, carrots and ranch dip, Go-gurt, GoGo Applesauce, pretzels, and peanut butter and jelly sandwiches cut into stars with a cookie cutter. Hawaiian rolls, different sandwich meats and cheeses were also available so that everyone could make their own sandwich, too. I decided to make a moon cake since it seemed easy enough, and would be on theme. (Miles actually suggested an earth cake, but I knew that'd be way more work decoration-wise, so I told him if we did a moon, I could put a little astronaut and flag on top and that sold him on the moon idea.) I bought a dome cake pan and actually tested it out twice before the party to make sure I wouldn't screw up his birthday cake, which ended up being a good idea--it was so much harder to bake than I anticipated. The one I got is huge--and it came with NO instructions. The company that made it has some suggestions on their website, but they didn't list baking times for this particular size. I think in the final cake I ended up using 2.5 cake mixes, and I'm glad I tested it out first because it had to cook at 300 degrees for about an hour and a half to cook all the way through. I also had to buy a heating core to make sure the center of it cooked all of the way, but it still turned out a bit fudge-y on the inside (which actually made it taste really moist and really good!) Overall it held its shape and was very strong. I made a Swiss chocolate cake with homemade vanilla buttercream icing, and mixed in some black food coloring to turn it gray. (I use Americolor gel food coloring because it's super concentrated and a few drops go a long way! This is the set I have.) I tried to create a moon texture by mixing in a bunch of different things into the icing--crushed Oreo's and silver and gray sprinkles that look more like rocks and it ended up giving the frosting a crunchy texture. I did a crumb layer and then a thicker layer of frosting and tried to create some crater-ish areas to make it more moon-like. I stuck an astronaut toy on top and made a little flag out of a toothpick and construction paper and cut out a little paper 4. We used sparkler candles, so I took off the flag for singing because I was scared it might ignite! I've always enjoyed making paper maché piñatas, so I made a moon one to double as a decoration and an activity for the party. I had some leftover 36" balloons from Matilda's party, so I blew one up most of the way, and covered it with layers of newspaper. I have a huge roll of unprinted newsprint paper that I got from our local paper for free years ago, so I just tore strips and used wallpaper paste I had left over from papering our bathroom at the studio. Miles even helped with part of the paper maché process. I did about 4-5 layers, 1 layer at a time, over the course of about 2 weeks. By cutting out strips of thin cardboard and joining them into a circle, I was able to create fa crater effect. I put paper strips over them until they were completely covered, and just put some around the moon until I was happy with the placement. With the concrete paint kit, you paint one color on first, then use a wet brush technique with the second color to blend it in and add dimension. It was SO easy to do--absolutely no artistic ability needed--and the effect was totally worth it. So cool. The sandy texture covered the edges of the paper strips really well helping to make the whole thing look way more like the moon. Using gaffer's tape, I attached strings to the inside of the hole at the top and then hung it from our curtain track. I kept it raised up until we were ready to use it and then lowered it to the kids' level. It ended up being super strong--every kid got to whack at it at least twice before my younger brother Robby broke it wide open! As an added and very vital part of the day, we hired a wonderful young photographer, Ellis Osburn, to help document the day. This allowed both Brad and I to focus on being with Miles - right there, in the moment, fully present the entire day. Having a birthday so close to Christmas, we've said from the beginning that we never want his birthday or Christmas to be focused on gifts, but for Christmas to be focused on family and spending time together, and for his birthday to really celebrate him and what he means to our family. Whether that's just spending a quiet dinner with just our family or having a party with all of his friends, it doesn't really matter as long as he feels loved and special on his birthday. The added bonus this year was he got to be so involved with me in the entire process. Seeing him light up with ideas and dreams made every second of the planning a joy. *This post contains affiliate links. To see my full disclosure policy, click here.